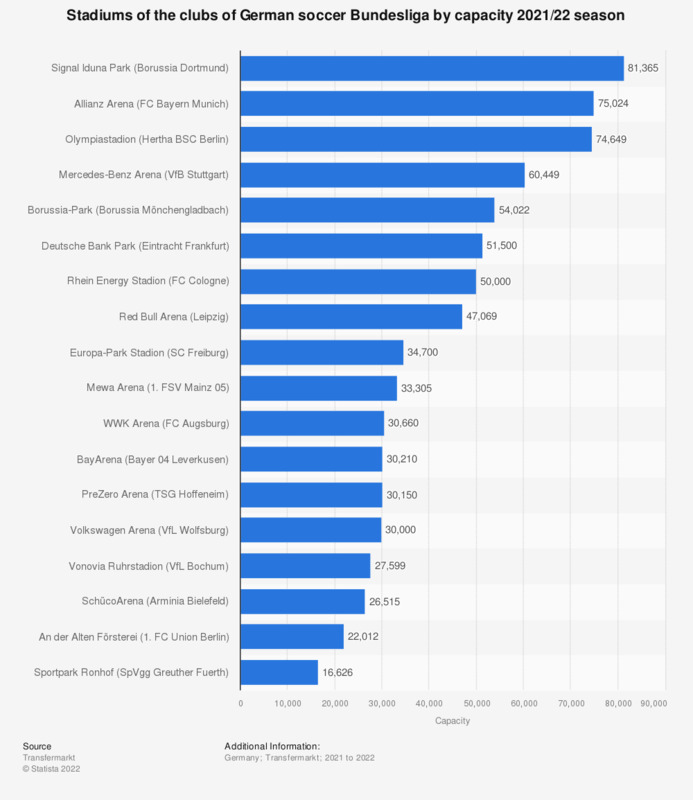 The statistic shows the capacity of the stadiums of the German soccer Bundesliga in the 2018/19 season. The Signal Iduna Park of Borussia Dortmund has a capacity of 81,359. The largest stadium in the Bundesliga is Signal Iduna Park, home to Borussia Dortmund, which has a capacity of 81,359, making it the seventh biggest stadium in Europe. The stadium was previously known as the Westfalenstadion, but was renamed Signal Iduna Park due to a sponsorship deal agreed in 2005. The stadium naming rights deal is worth an estimated 4 million euros annually to the club. Located on the southern terrace of the stadium is Dortmund’s legendary “Yellow Wall”, which is the largest free-standing grandstand in Europe with a capacity of almost 25,000. Dortmund’s stadium is close to capacity for most games, with an average of 80,297 fans watching each home game during the 2013/14 season. The club has a total of 55,000 season ticket holders and a reported waiting list of up to 10,000 people. The second largest stadium in the Bundesliga is the Olympiastadion where Hertha BSC Berlin have played their home games since 1963. The current Olympiastadion was originally built for the 1936 Summer Olympics and has a capacity of 74,400. The stadium was renovated for the FIFA World Cup in 2006 when it hosted 6 matches including the final. The Hertha BSC Berlin football club has struggled in the Bundesliga in recent years, having been relegated from the league in the 2009/10 season and the 2011/12 season. As a result, despite the team having the second biggest stadium, their average attendance of 51,889 in the 2013/14 season saw just 70 percent of seats occupied during their home games. Bayern Munich’s 71,000 capacity Allianz Arena is the third largest stadium in the Bundesliga. TSV 1860 München of the second Bundesliga also play their home games at the stadium, although they retain no ownership of the ground having sold their shares to Bayern for 11 million euros in 2006. A further 4,000 tickets were made available during the 2014/15 Bundesliga games, bringing the capacity up to 75,000. Although Bayern’s average attendance during the 2013/14 season was some 10,000 short of Dortmund’s figure, it was the only team in the Bundesliga whose average attendance matched its stadium’s capacity. In comparison, the league-wide average attendance stood at 43,502 during the same season. Bayern Munich season ticket prices range from 140 euros to 750 euros, with the high demand meaning there is a reported waiting list of 10,000 people.